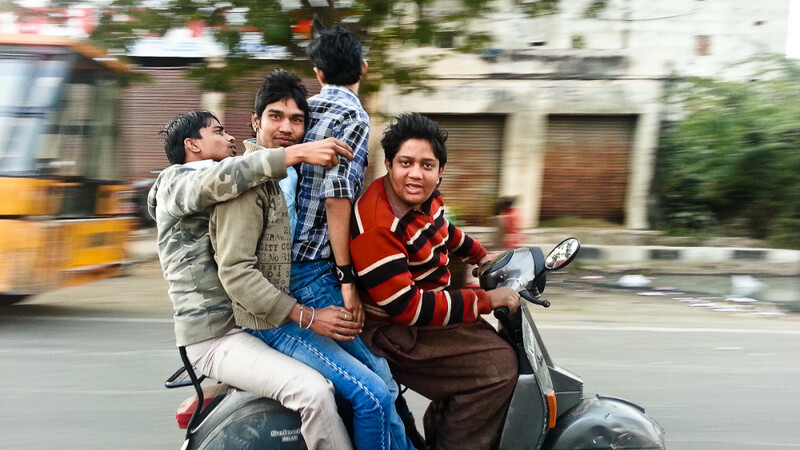 This is by far one of my favorite pictures of India because I think it describes the young people there. It is normally taboo to see more than one man on a bike in the United States but 4? I think this shows part of the poverty that India is known for but at the same time one can see the fun loving nature of the people. As I was watching them drive by the driver saw me and immediately leaned into the picture several times until I took just the right shot. They actually ended up following us to our final destination and asked us to take pictures with them. I was stopped quite frequently in India to take pictures with locals. Click here to see our India Picture Gallery and see more pictures from around the world as well. I love it when locals enjoy the camera. Easier for the travelers. I and my husband went to a remote village in the northern part of the Philippines and the first word I learned was their word for smile. Then i just say that word when I want to take a photo of locals. What is to do with poverty? They do not have other bike to go around at that particular time or day .